If you’re looking for a video about how to frost cupcakes, it’s moved! Click here for our instructional post on How to Frost Cupcakes. One of the most common questions we get is how to get the swirly cupcake icing. This is something I really wondered about, too, for a REALLY long time and honestly, I had a hard time finding clear instructions. It was almost like there was this code of secrecy among cupcake-eers. Well, I’m here to bust that code right open, not only because it makes your cupcakes impressive and professional-looking, but once you get the hang of it, it makes frosting cupcakes SO much easier and faster! Also, I’m in no way affiliated with Wilton; I recommend their products only because they’re inexpensive, easy to find at “normal” stores, and widely available in most areas. —A Wilton 1M star tip. The easiest is to grab this from Amazon! Although Walmart sells Wilton products, I haven’t been able to find this particular tip of the coupler that goes with it at Walmart; you can also try to go somewhere like Michael’s or Hobby Lobby. —A large coupler that fits the 1M tip. These are the plastic rings that attach the tip to the bag. —Cake decorating bags. Not an absolute must-have; you can use a heavy-duty Ziploc bag. But I really do love the disposable cake decorating bags. Basically, you want to hold the bag at about a 45-degree angle with one hand (most likely your dominant hand) controlling the frosting flow near the top of the bag and your other hand down near the tip. With the tip nearly touching the surface of the cupcake (near the center), gently squeeze the bag. With the frosting consistently flowing, move the tip from the center of the cupcake to the edges and go all the way around and then back toward the middle. Now…I had an entirely different post planned for today. And then on Monday night, I checked the Our Best Bites email and saw something about Sara’s candy corn pizza right before I went to sleep. As I was drifting away, I had this idea pop into my brain, clear as day, for Sara’s Colorburst Cupcakes, only made with candy corn colors! I frantically ran to the store the next morning and got a cake mix, a pot of yellow food gel (let’s not talk about what happened to the last one), and some full-fat sour cream because the non-fat yogurt I had in the fridge wasn’t going to cut it for these bad boys. In my frazzledness, I accidentally picked up a white cake mix instead of a vanilla cake mix, but I found this doctored-up recipe from Ann Byrn. I did replace the vanilla with almond extract on a whim and I didn’t regret it–they were mighty tasty. Preheat oven to 350 degrees. Line 2 24-cup muffin tins with white paper liners (although you may not make it to 24 cupcakes). Combine all ingredients except for food coloring in a large bowl and beat on low speed for 1 minute. Scrape down the sides of the bowl and then beat on medium for 2 additional minutes. These fun and festive fall cupcakes are delicious, and so much easier than they look! Divide the yellow batter evenly among the muffin tins. I used a standard cookie scoop, which measures about 1 Tbsp. I only had enough to make 20 cupcakes with the cups filled about halfway. Holding the edges of each pan firmly, bang the pan a few times on the counter to level out the batter. Repeat the process with the orange batter. Bake for 20-22 minutes or until a toothpick inserted into the center of a cupcake comes out clean. Remove from oven and allow to cool for about 5 minutes in the pan and then allow to cool completely on a cooling rack.When ready, frost the cupcakes and garnish with a candy corn. Thanks for the tutorial! I've always wanted a faster way to frost cupcakes. I'm going shopping for that tip today! uhm….my hubby…the Engineer and I the Architect….yep…I can totally relate! I JUST made these last night!! Love them! I don't think I'll frost cupcakes with a knife ever again! Thanks! I do what Lorraine said. It started because I couldn't actually find the big coupler, but I've never bothered looking for it since! Great job on the video. I tried to take pictures myself while doing it for my Halloween cupcake post a couple weeks ago…it's not as good as yours! These are so darn cute!! I believe I am the worlds worst cupcake maker so I'm going to have to study this video, LOL! These are adorable! Love it! Thanks for sharing the idea. The video was great. I just love your site!! Thanks so much for the frosting video!! I've always wonder how they make it so perfect!! I love this candy corn idea! Thanks so much! Love these cupcakes – they are adorable!! love the candy corn cupcakes,what a great idea! These look so cute…my kids will love them! Also wanted to tell u I love your blog….the pictures, the recipes, the instructions….all of it!!! Thanks for all your yummy inspiration! LOVE the candy corn cupcakes (and the original ones). I even put the original ones in a box once and shipped them 2000+ miles away. They were a huge hit. I will be making them for our Halloween party on Friday night. I had something else in mind, but this is WAY better. Your blog amazes me more and more each day! Oooh, those turned out really cute! I love the idea of doing candy corn with a real candy corn on top. Super cute! Oh my gosh, I LOVE these!!! So super clever! I love everything that imitates the classic candy corn! Adorable! That is awesome! I am in love with candy corns. Thank you for the tutorial and the great idea. What a great idea! I love that bursts of inspiration send you fleeing to the store. You've piqued my interest, what happened to that first batch of gel??? Great idea and I LOVE the video tutorial. So fun to hear your voice! Do videos more often. Very cute cupcakes–so creative. Thanks for the cupcake frosting tutorial. I'll be getting the tip and coupler this week! How fantastic! Liked the video… I'm with your husband, it was the best way to go. 🙂 Thanks for the info!! I decided to make these yesterday, and thought I had everything for them. I had no white cake mix, so I decided to try yellow. I added some yellow food coloring, to make it a bit brighter. I did the whole thing, figuring I'd put red in after I put yellow in each cup. Then, I discovered that my red was dried out. I searched for another solution, and found red kool-aid powder. It was my only hope, so I tried it, and it worked! It gave the orange part a little extra flavor, too. The colors weren't as vibrant as yours, but my kids immediately recognized what they were. They were a hit! Totally and completely adorable!! So colorful!! Videos really help me to learn…I must be a visual learner. Great cupcakes. Looks like a great way to ice them so I am going to try it! Those are so cute, Sara. I love watching you in action – thanks for the video! Thanks Emily, but I can't take any credit- that's Kate! I'm surprised you couldn't tell from the video because my fingers are much fatter, haha. I just discovered your blog and I am so glad I did. Love the candy corn cupcakes idea. My youngest daughter is going to be a Candy Corn Witch for Halloween so we will definitely be making these! Wow, these cupcakes are inspired! They look so perfect!! Very cute cupcakes.. and great tutorial on frosting! Oh darn, I wish I'd seen these yesterday. I just spent last night making cupcakes for my son's class party and these would have been perfect! (I ended up topping them with your nutter butter ghosts though). Is the recipe missing a liquid measurement (water)? I just tried using it as written with only the sour cream & oil & eggs and it was super thick. I had to add about 3/4 c. of water to get it to cake batter consistency. Heidi–The recipe is definitely thicker than regular cake batter, but not to the point where it's difficult to work with. But it's oh-so delicious… 🙂 How did it turn out with the water? These are soooo cute! Where do you get food color gel? Can I get that at Joann's or a specialty store? I'm making these tomorrow! I forgot to buy the larger coupler today so I'm going to have to use they tip that Lorraine gave. Wish me luck! They are going to make a bunch of adorable ballerina happy after class tomorrow! Those are wonderful, just love them! Christine, I don't know for sure if they carry it at Joann's because it's been so long since I've lived by one (okay, like almost two years, but still… 🙂 ). However, if they carry other Wilton products, I can virtually guarantee that they carry colored food gel. I've gotten mine at Walmart, Hobby Lobby, and Michael's. If you get it at Walmart, don't get it in the food aisle–go back to where the crafts are. You can also find Betty Crocker food gel in the baking aisle, and they work GREAT except for the fact that the box of classic colors only comes in red, green, yellow, and blue (the others are neon, I think), so you'd have to try and blend your own shade of orange. will you two ever tire of my telling you how amazing this website is?? I forgot I had soccer snack tomorrow. Hooray! Guess what they're getting. I'm definitely going to buy the Wilton orange because I had a heck of a time blending my own from the Betty Crocker stuff in my pantry–it was hard to not have it come out looking like Thousand Island Dressing color and that is just NOT appetizing when we're talking about frosting. Thanks for the great recipe. I made orange and black cupcakes for my son's class party. What a hit. The cupcakes are yummy by themselves (without frosting) but the kids had fun frosting them. Multiple colors were a hit! I am fairly new to your blog but I really love it! You guys are awesome! I did find the 1M Star tip at 2 of my local Wal-Marts but it was in a cupcake decorating set. It had 4 different tips & 8 disposable decorating bags. They had everything needed at my Joann's. OK so these are so stinkin' cute I can hardly stand it. I ran to the store tonight and bought everything I needed to make these tonight so they'd be ready for Halloween tomorrow. I love anything that resembles a candy corn because I have a Halloween birthday, and up until I was about 8 years old I thought candy corns were "happy birthday hats" that came out this time of year just for ME! SO question- when I made my cupcakes the bottom half looks brown, not yellow. Once I cut it open it looks yellow, but through the cupcake liner it just looks brown so it kind of ruins the illusion of looking like a candy corn. Any suggestions for next time? I only baked them for 20 minutes so it's not like I burnt them. Jamie, this is something we've been hypothesizing over on our Facebook page for this post. And to be honest, we really don't know why this happens to some people or in some cases and not to others. I have one light-colored aluminum pan and it is COMPLETELY and utterly trashed. Disgusting. But it turns out beautiful cupcakes! 🙂 I also have two dark blue silicone pans and they turn out okay cupcakes, but it's more of a problem with the rise and not the color. –The Liners. I have noticed that I get prettier results when I use Cake Mate Liners instead of Betty Crocker. I haven't tried the Wilton liners. –The Pan, Part I: I don't know if anyone else does this, but I always, I always use cupcake liners, a) because I'm lazy and b) because my pan is disgusting. And sometimes (because of a), if there's no visible yuckiness in the pan, I'll just put it back in the cupboard without washing it. I'm starting to think that if you do this a lot, you may have a thin layer of residual oil in your pans and that that may be causing the liners to turn brown when they bake. Oh me oh my. I came across your idea for these cupcakes on Think Different Act Normal and knew what had to be done. Thank you for such a great idea! Here's a link to my not-as-colorful version. Too adorable! I can honestly say, these little cupcakes are delicious, Kate! Thanks for bringing them to the party! I LOVED the frosting, soooo good. Try these, people! Adorable cupcakes and great tips! So Iam Way excited to try this i am baking it right this moment actually. And to tell you the truth i wen out on a limb and used the recipie to make cakes instead of cupcakes. i hope it turns out. i guess i should of asked yall first. I guess we will see the end result in 8 minutes. Wish me luck and thanks a ton for the awsome recipies and ideas ladies. I am truly a die hard fan i would say i use at least of your recipies a week. Thanks A Million!!! Just went out and got 2 of the 1M tips. I always wanted to do my frosting like this Soooo excited to try it out on my St. Patty's cupcakes tomorrow. Just found your site and having so much fun popping around and seeing all your great recipes and tips. I'm so happy I found your site. Thank you for the tutorial. I'm actually baking cupcakes right now and I'll try frosting those cupcakes. Wish me luck! Thank You for this! My son is turing 1 in November, and we're having his birthday party on halloween weekend this year! I have been looking around trying to learn how to frost cupcakes because I think that my cake tastes better than a lot of the bakeries around where we're throwing the party! This is perfect! 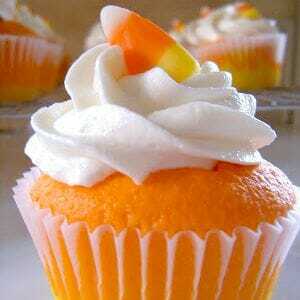 I also love the candy corn cupcake idea! I may do that too!! LOVE these!! I just made them, but used a different recipe I had… and mine don't look as vibrant. Next time I'll use this exact recipe! Your blog is amazing, with so many amazing recipes! I have added a link to these on my blog. I had seen them a few different places, but I wasn't sure who the original creator was. Now I know. Thanks for so many amazing ideas! do you mean the wilton icing colors in the small jars? i only saw those and the food gel in the tubes. Hi! I came across these cupcakes and have been waiting a few months to make them! A couple of questions though…I notice that the recipe calls for 3 eggs…do you use the whole egg or just the egg white? Could this have anything do to with why some people are experiencing the yellow part being brown? And I got the Betty Crocker liners before I read the comments. Will I be disappointed with the results? 🙁 Thanks! I am so glad to find this recipe. I used to have y'all bookmarked in my favorite blogs to read, but then my computer crashed and I lost them all!! I've been slowly trying to find my favorites again, but I just couldn't remember them all! Now I have you bookmarked again and ready to follow…I think we'll try out these cupcakes to take to school. My kids will love them!!! Although I may attempt mini cupcakes since kids usually throw most of it away anyway at school parties and I'll have 2 parties to bake for…wish me luck! Love, love, love these! At my hubby's office, they have "Monday Munchies", and everyone takes turns bringing treats to work. Knowing his turn was coming up soon, I've been scouring the internet for days looking for the perfect fall/Halloween treat. These were perfect! I made mini-cupcakes. They turned out so cute, and they were a big hit! Thanks for sharing! I just made these cupcakes and I experienced the same issue with the cake on the outside (in the Wilton liners) looks brown so it is so not as cute as yours? I have NEW dark pans and I only cooked the cupcakes for 18 1/2 min. I am soooo disappointed! I was going to make your cupcake frosting but I am too bummed to do it with the way the cupcakes came out? Is anyone else having this problem???? HELP! I was thinking of dropping a real piece of candy corn candy in the center of the cupcake before cooking and haveing it melt inside for flavor…anyone try this yet? make it fun when you bite into it? cggap25–My guess is that it's the pans; people seem to be having trouble with the dark pans that they don't with the silicone or the lighter pans. I'm sorry! Love the colors you got on your cupcakes they are fantastic. I am featuring them on Thursday on Party Cupcake Ideas. I was just wondering what you could use in place of the sour cream?? rikky- yogurt works great too. Plain or vanilla, or anything light colored. I just made cupcakes with strawberry yogurt and it tasted amazing! Would strawberry flavor work in the Candy corn cupcakes?? I think that would be interesting. absolutely! You can't taste the actual flavor of the yogurt, it just adds a subtle sweetness. Just use one that doesn't have chunks of fruit and you'll be good to go. I've used banana and vanilla before too with great results. ugh! I wish I had read the part about tips to prevent the browning. boo! I made these this morning and they look perfect! You do need to lower the oven to 325 and I used vanilla as I didn't have almond extract. Thank you for sharing! Made these yesterday for our Halloween party. Hands down the best tasting and cutest cupcakes I've ever made. The frosting was amazing. Although I did have to make the milk/flour base 3 times before getting it right. The first two times I over cooked it and it got too thick, too fast. I think there is a typo in your recipe, in the beginning where it says to use 2 24 cupcake pans, shouldn't it say 2 12 cupcake pans? I had one pan come out with browned ugly bottoms and one pan came out with cute yellow bottoms. Both were darker non stick pans, but one was on the bottom rack and one on the top, that was the only difference. Must be the reason though. So, what does the sour cream do for the recipe? Can you just make the cupcakes as directed on the box and then just divide the batter & add color gel to each bowl? Not sure why you can't use the regular box recipe? Jen–You certainly don't HAVE to do things the sour cream way, you can still make the cake mix according to the package directions. But the sour cream makes the cupcakes very moist and tender, kind of like a cupcake from an awesome bakery rather than from a box. Hey girls! I am looking at this through your new blog site (yay!) and wanted to let you know that the video isnt working? It’s not even showing up on line screen. I hope this is just a transition problem, I cant wait to see the video! Video still not working 🙁 I did find the 1M tip at Michael’s today, though. I was surprised. Video’s still missing…? I’d love to watch it again! Thanks. hi there! these are so cute and i want to make them for my son’s baseball team in their colors. however, i noticed that this recipe is different from sara’s colorburst cupcakes. in your experience, which one is better? also, could you just use vanilla cake mix instead of having to doctor up the white cake mix? thanks! Honestly Kristen, they taste exactly the same to me! And you could use a vanilla mix as well, that works fine. It will affect your colors though because it adds a yellow tint to the original batter, so keep that in mind if you are coloring them. I would love to be able to see the video, but it looks like it’s been missing for a while… Any chance it will be back soon? Love your site! I am hoping to frost cupcakes this week, but the video is not loading. Help! Thanks! This is super helpful — I’ve always wondered how to make the cupcakes look so good, and never realized it takes such a large tip. But I really, really hope you’ll fix the video on here. That always helps a ton to see someone actually doing it! I also want to see the video! I just got my cupcake tip yesterday for my son’s birthday next week and I am really nervous about messing up with the frosting. Any chance of the video coming up again? These are so adorable and I want to make them for our fall festival at my church. The only thing is I have to individually wrap the cupcakes. Will this frosting harden so I can do this without them getting extremely messy when they unwrap it? No Heather, this frosting will stay very soft! Is there anywhere else we can view the video? I would REALLY love to make these on Saturday for the Oktober Fest. These look so perfect! Video still not working, but your instructions are great!!! Wish me luck! I was hoping to make mini cupcakes as I “think” they would go further, plus I’m bringing them to a party Saturday, my question is how many (in your expert opinion) would I get if I make them mini size? Oh and would I still need to make a double batch of frosting? It was a blast at my son’s football banquet. I saw the pic of your cupcakes on pinterest and I made them last week. SO good!! Im actually featuring your recipe on my blog right now with a link to you blog. Thank you!! I did something like this for my nieghborhood Trunk or Treat! Except I did it with all three colors and then topped with icing/frosting and sprinkles! I even found I am turning pro with the icing/frosting bag. They turned out way cute and yummy! There were a few left over at the end of the night, but I took them home and they were gone the next morning! I got alot of compliments! Now if only I could learn a YUMMY icing/frosting recipe! I might blog about them soon…if you wan to check out my blog! Is there anywhere else we can get the video?? I’d love to make my flat cupcakes cute! Pretty great post. I simply stumbled upon your blog and wanted to mention that I’ve truly loved browsing your weblog posts. In any case I’ll be subscribing on your feed and I hope you write once more soon! 2. You get more control the closer your hand is to the tip. Fill the bag about halfway with icing. Then, hold the bag between your thumb and forefinger so the tip rests just passed your pinky. Squeeze your thumb and pointer together to section this bit of icing off from the rest of the bag and twist two or three times so you have a grip on just the icing closest to the tip. This will help you control the bag better and you wont have to squeeze as hard to get the icing out. when you need more just simple push the icing down from the back of the bag to the tip again (make sure you twist the back of the bag as well to keep the icing from falling out, and hold it upright with your free hand… as you get more experienced you can make the amount of icing in your hand larger and you’ll still have decent control. its all about practice). Another reason this tip is helpful: it will keep you from bursting your bag along the seam/keep the tip from popping out. You wont need to create as much pressure and you also dont have to continuously refill the bag. If you do burst the bag, simply cut the tip out (if it wasnt the part that popped out), cut a piping tip hole in a new bag and place the tip in, and then put the old bag inside the new one and squeeze int he contents. You’ll lose a bit of icing to the outside ofthe old bag, but its a lot less messy than trying to scoop from the back or putting it back in a bowl to fill the new bag. 3. Less is more with frosting with this kind of tip. You dont want the icing to go passed the outer edge of the cupcake so its really about piling the icing up. You dont want the tip to touch the icing below as this will cause the icing to spread outward. Just pile it up with two circles and pull up at to finish (dont squeeze while pulling up…you’re frosting cupcakes, not making soft-serve ice cream cones). I love the 2 tone look and will try it on some cupcakes I have to make today! I love the candy corn cupcakes – so cute! I’m almost getting ready for fall and plan on making lots of these for Halloween gifts for friends. Thanks! These look amazing! I know you probably don’t do linky parties, but if you do, I’d love it if you linked this candy corn project to my post. Found your recipe via pinterest and have them baking right now. Not sure if I overfilled my liners or what but I only got 12 cupcakes and then 2 larger cupcakes. The batter seemed really thick so am wondering if I did something wrong. I dunno how you came up with this idea but I just want to say how awesome it was! I love that it was simple and so creative for this halloween party I have tonight! I had to use a white cake mix from scratch because my neurotic baking side would not allow me to use a box ha ha but I had to wilton gel colors and now I cannot wait to decorate it! Awesome idea! Thanks. What does the sour cream do to the cupcakes? I’ve never heard of that before. Love these. We are making these for my sons Halloween party at school tomorrow! These are so fun! I put my cake batter into 1-quart Ziploc bags and cut a corner to make it easier to keep the batter under control when I was filling the cupcake liner. It worked out very well and was not messy. first halloween! How do I make the cupcakes eggless? What is the purpose of the almond extract? I’ve never used that…is the cake recipe good? I know the thick batter would help with the batter not running together. Hey there… I was really wanting to try the frosting this is described here. The link isnt working. Can you help? thanks! !